1. Money. Tours range from $40 to over $80 for a one-hour tour of Panmunjeom, the Joint Security Area, where a cluster of official government buildings straddle the actual border. The whole tour, including lunch, takes about 4 hours. 2. To make North Korea look silly and childish. They spend a lot of time talking about the petty things the North Koreans do to make themselves look better. In fact, it makes South Korea look pretty damn silly itself, because they always come back with an equally childish reply. In the 80's, SK erected a 100 meter flagpole in Daesong-dong, or "Freedom Village," the only town visible from the North. 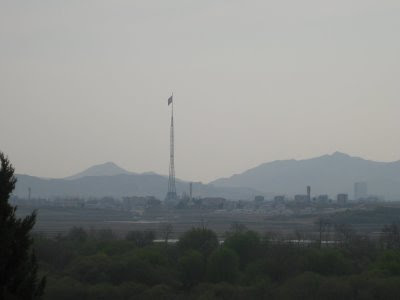 NK responded by erecting a 160-meter tall flag pole, the tallest in the world, in their border town. When our South Korean tour guide told us this at the debriefing before the tour, she smirked and said "but our flag is still bigger." After a 15-minute debriefing at the military base just inside of the DMZ, including a brief history of the Korean war and the DMZ itself, we boarded a military bus for the 2km ride to Panmunjeom. We were instructed to get off of the bus in an orderly fashion, and to immediately line up in 2-person rows. We walked through the building and into the MAC building, one of three small blue buildings built on top of the physical border and used for official two-party meetings. The border runs through the center of the buildings, so half of the buildings are located in each country. The microphones on the table mark the location of the border. 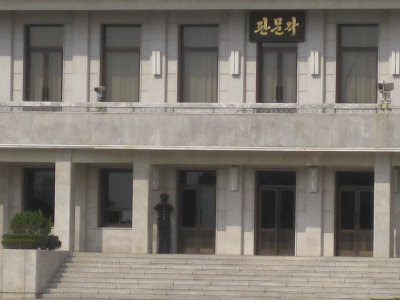 This is the only place in the country where you can step freely into North Korea and, just as freely, back again. 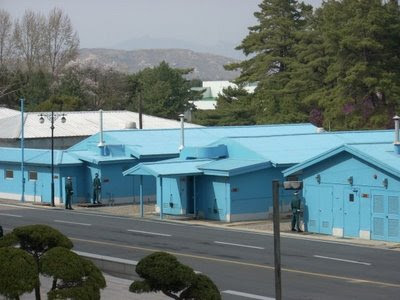 The other soldier was guarding the door behind him, which opens into North Korea. We were instructed not to go behind him. 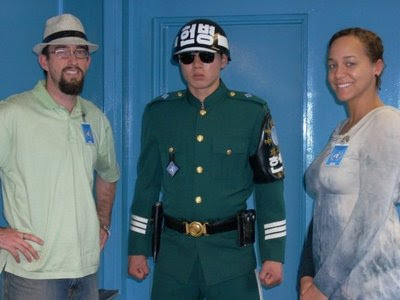 If a North Korean soldier opened the door and grabbed us, there would be nothing he could do. They were all very serious, and it just felt plain awkward to be there, smiling and taking pictures. But we did it anyway, because we were tourists, and that's what tourists do. We also climbed a pagoda that seemed to be built just for tourists to gaze over the border and take pictures of the North Korean guard standing in front of their official government building. Which is what we did. He just stared back at us with his binoculars, and would occasionally duck behind the post to his right. Before we climbed the tower, we were told not to point or otherwise make any gestures towards this building, as there were cameras mounted in multiple places that were constantly taking pictures of us. 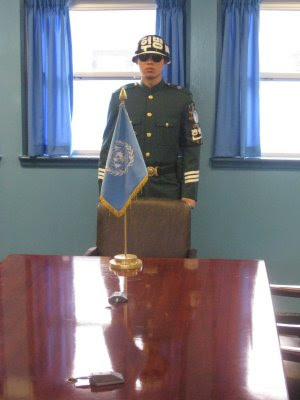 NK would use these pictures in their propaganda campaigns attacking the US or the UN or anyone else that happens to annoy them on any given day. There is supposedly a strict dress code to get on this tour (ie no t-shirts, ripped jeans, or sandals), but three really dirty Europeans managed to sneak into our group unnoticed. They all had nappy dreadlocks, tight tshirts, and saggy, ripped jeans. It was easy to picture them on posters plastered all over Pyongyang, with a caption like "They can't even afford clothes that fit!" or "They don't bathe!" The pagoda tower also afforded us a nice view of "Propaganda Village", SK's pet name for the only NK village visible from Panmunjeom. It's all rather funny to me, since SK calls Daesong-dong, their own border town, "Freedom Village." There seems to be a lot of propaganda flowing freely on both sides of the border. SK claims that Propaganda Village is not a real village, and that NK citizens are bussed in for the day to walk around and make the town appear lived-in. Some of the buildings, they claim, do not even have windows. Daesong-dong, in comparison, has a population of about 200 people. Were it not for an exorbitant gift of farmland (something like 30 times the average Korean's plot), and an exemption from taxes and the military draft, I can't imagine that many of those 200 people would choose to stay. It seems to me that "Freedom Village" is really just SK's own "Propaganda Village." Afterward we visited the UN's gift shop, where you could buy North Korean-made blueberry wine, some NK money (expensive!) and t-shirts and other knick-knacks to prove that we had been to the edge and back. It all smacked of cheap sensationalism. So I bought some shot glasses.